Borrowing costs, the last defence for austerity? Just in case you didn’t know – IMDb (Internal Movie Database) is a hugely popular website that encourages the public to rate films out of 10 and subsequently calculates the average rating of each film. I love IMDb. It reflects the point of view of the film going public that could previously only be gauged by Box Office takings. If you wanted to learn about the quality of a film you would have to rely on the opinions of critics, but with IMDb came an opportunity for film fans to contribute to a truly reflective audience reaction. This is the tale of an idiot. Based on the true story of Christopher McCandless, Emile Hirsch plays the role of a young man disillusioned with society who gives up all his earthly goods to truly experience nature. It culminates in his death in Alaska when he realises that he can’t feed himself. It’s of course tragic that McCandless died but there’s also no doubt that he was an idiot. Unfortunately, Sean Penn directs this as an anti capitalism story of the freedom of the human soul and in support of the man who wasted life in such a reckless way. A tale of lack of preparation is told as a story of inspiration. It’s tragically stupid, but still it’s better than Trainspotting, Scarface and Gone with the wind…….apparently. Just over 300,000 people have contributed to this rating. It makes it the 164th best film of all time. One position ahead of Life of Brian, a few places clear of the Terminator. It may be a clichéd complaint but Avatar is a rip off of the Pocahontas story. It’s a boring rehash of the old evil invading army vs the natural world done 30 years ago in Return of the Jedi. 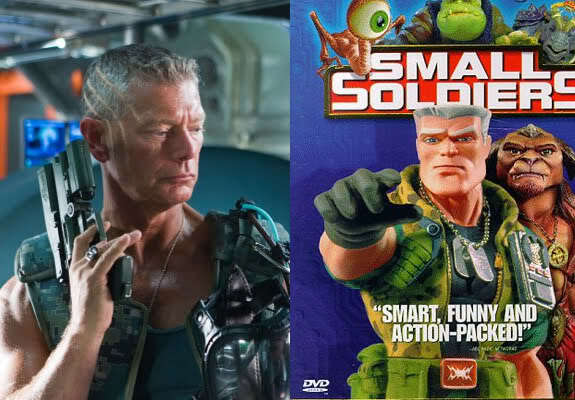 Stephen Lang’s role as Colonel Miles Quaritch is modelled on the ultimate armed forces bad-guy…….‘Chip Hazard’ from Small Soldiers. And it’s just another excuse for director James Cameron to spend lots of money on special effects and sacrifice writing, performance and plot. Avatar is the ultimate dull blockbuster. But somehow it confused people with pretty 3D jellyfish floating and plenty of flying around. So this is apparently enough to place it above Life of Brian, often considered the culmination of Monty Python’s genius. This is rated as the 34th best film ever edging out Kubrick’s dark comedy classic Dr Strangelove, Francis Ford Coppola’s intense masterpiece Apocalypse Now and Orson Welles’ powerful portrayal of a media giant Citizen Kane. Of course it isn’t better than any of these films. It’s not even that good. It’s a rip off of the Terminator 2 relationship between an unfeeling killing machine and a kid whose life is threatened with some misguided symbolism of a plant pot and milk thrown in. I hope that doesn’t sell it as it’s really not worth seeing. Director ‘Luc Besson’ is now associated with the Transporter and Arthur trilogies. Not really a body of work to unseat Kubrick, Coppola or Welles in the history books. So what’s the solution? IMDb is still a good guide and I discovered a number of films through its ratings. For instance it champions much of the late Sidney Lumet’s great work with the likes of 12 Angry Men and Dog Day Afternoon rated highly. But if you want a more reliable guide then the critics are still the best. In particular the website “rottentomatoes” which amalgamates scores in a similar way to IMDb but only allows contributions from film critics. But as always when in doubt follow the good Doctor Mark Kermode and he will show you the light.